With each of us, God is as fully and as powerfully present now, as He was with the great founders of the world's imperishable religions. The space around and within us is as completely lit up with the splendid Light of God, as the space was around and within the greatest prophets, saints, sages, mystics of the ancient world. There is no less of God's Presence, Power, Grace, in this hall here and now with us, than there was in the Italian garden where St. Augustine encountered the Divine, nor than there was on the banks of the Jordan, when Jesus emerged from that river, after being baptized by John. At no period in human history, at no time in our lives, at no point in space, and no moment in time, is God less present. His absence is purely a work of the limitations in perception of the experiencing individual. It is the function of the original sin, the original Self-ignorance and ignorance of the all-pervasive Being in the Universe. The sun shines on the world no less brilliantly now, than it did a thousand years ago, and though the sun be shining, the blind see it not. They live in darkness and assert that there is no such thing as sunshine and light. The sun does not cease to be, because some men do not perceive it, on account of a defect in their power of physical perception. God is not today less brilliantly shining in the world nor absent from the world because thousands do not see Him, - even as the thousands during the ancient days of glorious spiritual traditions did not see Him. It takes a person who has freed himself from the limitations in perception, to see God at any time, anywhere. Such free persons of clear-eyed vision are men of universal Love, divine Wisdom, purified Intelligence. At any period in world-history, and anywhere, we can experience God. God is now here, everywhere. He is present with us, around us, all about us, with all His infinite Beauty, Grace, Love, Perfection. Today, there is not less God in the world than there was in the times of Abraham and Moses. Let not the human mind deceive itself into thinking that there is less God in the world today, because there are so many wars and so much of evil. That is a false idea. At no time God is separated from us, and absent from the world. Have our roses stopped smelling fragrant because there are many wars and much evil in the world? Even so, God has not stopped emanating His Light and Grace to humanity, because there are too many wars and much evil in the world. The assumption that God is away and apart from the world because the world is a victim of many wars, much evil, injustice, suffering, more today than ever before in history, is one of the delusions of mankind. On any day the sun is not away and apart, or withdrawn from the world, but it is only the dreamer who, though lying on a sand-hill beneath the summer sun, is dreaming that he is trapped in a dreadful forest fully covered by pitch-darkness. Nowhere is the sunshine absent except functionally for the dreamer. Even so, nowhere is God absent in the world, or in one's own life, except functionally for the dreamers trapped in pure sense-experience. Without God, we could not live, there could be no life, no conscious operations of the intelligence, no experience whatsoever. Denial of the Divine is easy, but is the weapon of those who are industrious in seeking sense-pleasure and fulfilling a life that is imprisoned in the body and its immediate needs. We live, move and have our whole being in God. What force of Nature formed us, and what imperishable essence indwells us? God. Where are we now? In God. Where do we go from here? To God. What is the aim of all life and experience? God, conscious Experience of the infinite Beauty, Power, Wealth, Peace, Delight of God. What are we, in our ignorance of God? Children of God who are functionally separated from the Peace, Joy, eternal Life of God. What are we, when we consciously experience God? Children of God executing our wondrous functions in Knowledge, Power, Grace, Peace, Beauty, Blessedness, Freedom, Perfection. The world may be old; but God has not aged even by a second since the creation billions and billions of years ago. Time does not affect Him. Space cannot span Him. He is beginningless and has no end. He is ageless Being of infinite Perfection. He is the Truth that was, is and ever shall be. God alone was, is and will always be - God as Light, God as Love, God as Life, God as Beauty and Delight. Something deep in our Soul is always voicing with John the Baptist, "Beloved, now are we the sons of God". Centuries after Jesus declared, "The Kingdom of Heaven is within you", Meister Eckhart could assert, "God is at the centre of man". It is a universal and timeless experience. It expresses itself in all ages, and in all cultures. As a matter of imperishable fact, we live in the Kingdom of Heaven that is within ourselves. God inside man, God outside man, God within, and as all creation, and God transcendent of all creation, God everywhere! "Lift the stone and thou shall find Me; cleave the wood, and there am I", says God in the Bible. Repeated and self-sustaining experience discloses to us God everywhere. There are corroborations of the same experience in all the great and time-tried works of the world. Where in the ocean is saltishness absent? Where in the entire creation, is the sustaining Essence of the Creator absent? As butter pervades the entire tank of milk, so does God pervade the entire universe. The heavens declare the glory of God no less today than they did in the Biblical times. In the starlit firmament above, God is not less visible to contemporary humanity than he was to the people of the times of Immanuel Kant. Closer to us than our own breath and jugular vein, God is, and can be experienced by any one of us, at any time, if we would fulfil the conditions and gain the equipment. Were there amidst us a dozen of the greatest sages, mystics, saints, prophets, where would they experience God? Here and now. Where did the great sons of the past experience God? Wherever they were, in the vast world, and at whatever period in human history they occupied. There are many grades and types of the experience of the Divine Consciousness, that are accessible to the most earnest of spiritual aspirants. A portion of consciousness at the back of the angry person is not involved in the emotion of anger. It is calm, peaceful, luminous and counsels him, "Don't be angry, forgive". This is, at the present stage of his development, a representation of the Light of the Divine. Later, when he rises to yet higher states of such consciousness, he has an immediate touch of the Divine. Even as the bud unfolds, as it blooms in its colour and fragrance, the soul in man, being nourished by inner moral and spiritual qualities and deep reflection and discrimination, unfolds its capacities for experience of God. The more is the inner equipment for the experience of God, the sooner one has it. God, or the Truth, is pure Consciousness, and is therefore, to be approached in, and through, the consciousness liberated from the limiting physical and mental experiences. God is not a mental concept, nor an object of mental search, but the supramental infinite Being that transcends all mental phenomena while supporting them; even as man is infinitely more than, and transcends, any thought that may rise in him, and that he may witness, deal with and dismiss. Like the ladders used for climbing over the roof of the house, the mental instruments have served their purpose, and are no more helpful for knowing the Truth. Truth is to be known, experienced, in Truth and by Truth itself. God is Spirit, and is to be known, adored, experienced, in Spirit, through Spirit, and as Spirit. Thoughts and feelings, however helpful in the preliminary stages and states of progress, are only helpful to lead us into an experience of the Truth. We have to go beyond thoughts and feelings. We cannot see the face of God through the veils of our worldly thoughts and emotions. So long as such thoughts and such emotions are in us, we see them, not God. To see God, our mind and heart are to be rendered luminous, calm, still, with the nameless, formless, radiant divine Love. God is not emotion, and cannot give all of Himself to us in emotion, unless it be devotion, or divine Love. We have to go beyond emotion. Emotion was a help, in the process of attaining freedom, and has now to disappear into something other than itself, the Spirit. God is to be known and contacted in God, by God, and for God's own sake - which is the same as contacting God for the sake of everything else and more than everything. God is not sensation, and cannot be known by any kind of nervous excitement and pleasure; though, in the beginning stages, nervous pleasure and knowledge by sensation is your way. Stop not here. Proceed forward until your consciousness, liberated of emotion, thought, and every other limitation, knows itself and everything directly, with, and in, the unlimited Light of Consciousness. Through good emotions, conquer negative emotions. And, conquer the good emotions, by the Love that is divine, all-inclusive, persisting, permanent, and transcendental. We can detach a portion of consciousness and observe the activities and experiences of our mental, or emotional, or psychic, being. We carry in ourselves the capacity to stand back from the thoughts that arise in us, and watch them. We can, in consciousness, transcend the field of thoughts and observe the observer of the thoughts. In this process of transcending the field of the experiencer and the object experienced, we rise into the unobserved, all-observing Consciousness which is infinite, eternal, unchanging, Truth, God. To the extent we perceive and experience this, we have an experience of Truth, here and now. With sufficient self-discipline and self-training, we can learn to use to the optimum our self-transcending and all-exceeding capacities. Our knowledge and experience of the outer world are not direct, as they are obtained through the instrumentality of our senses. If the senses are defective, our knowledge and experience concerning the world are also defective. We can have no direct experience of anything except that which is within ourselves, and is the experiencer himself. Our experience of any fact, or thing, is a dependent experience; it is dependent upon the instruments of knowledge employed, and the defects of the instruments infect with defects the knowledge thus obtained. Not even of our own body, of our own thoughts have we any direct experience. Indirect experience obtained through physical, or psychological, instruments of knowledge is subject to change and contradiction, and is ephemeral. Of the experiencing and observing Consciousness in us alone we have a direct experience by identity, oneness, unity. We know it directly, by, in, through itself. Without it we are nothing. It is the Kingdom of unending Peace and Happiness, the foundation of all knowing and experience. When we are rooted in a deep and dynamic awareness of this infinite subjective Being of Light and Love, we have an experience of God. In Nature and its beauty, in the human individual and his aspirations, in the intelligence and its operations, in the goodness and its works, we have the eloquent presence of God. One may not be able to see God directly, but one is able to see Him in the luminosity of your intelligence, in the sparkle of your eye, in the noble affections of your heart, in the works of your love, in the manifestations of your genius. Through the inspiring and illuminating works of the greatest men of the world, God speaks to us. We have an effective indirect knowledge and awareness of God, by a deep study of the great works of mystics, men of transcendental experience, sages who have transcribed their experiences of God. As long as our mind and heart are absorbed in such works, our state is one of indirect contact with God-experience. By exercise of our reflective capacity, and by constant inquiring into the "how", "why", "wherefore" of all existence, we have a deep awareness of God. When such an inquiry is deep, prolonged, and fruitful, one has a deep inner awareness of the reality and the nature of God. A deep study of the philosophical works grants us rational knowledge of the reality and the nature of God, which could be made the foundation for our intuitional and direct experience of God. There is a sudden influx of the Divine Grace and succour, when an urgent call to God emerges from the heart of the human individual who is trapped in situations of overwhelming suffering wherein he is completely deprived of human strength, support and resources. Sometimes it so happens that a shipwreck in the mid-sea causes in some of the people involved in the tragedy such a sudden and tremendous faith and complete reliance on God, that in that instant of total surrender to God, and one-pointed and concentrated longing for God's help, they experience an encounter with the divine Presence. When suddenly exceptional circumstances emerge and surround our life, they bring out from us unusual powers which grant us an experience of the unfailing Grace of God. In the history of humanity, we find some persons had thrown themselves, voluntarily, into impossible situations, demonstrated unusual faith in God, and experienced God's Presence. A thing which is within ourselves, cannot be for long ignored. The most fundamental thing, the Life of our life, the divine Being, asserts itself, and whether or not we want it, we experience it in one condition or the other, in one situation or the other of our daily life. Born of God, being secretly sustained by God, constantly expressing and using His energies, it is our inevitable destiny to find Him, here, there, everywhere, and express in daily life something of His Peace, Love, Strength, Beauty, Happiness. The invisible God is not a distant inaccessible beyond, but an all-colourful Consciousness and an all-creative Energy immanent in, and operative through, all the visible things and beings. Through the visible here, we know, see, experience now the Invisible. The nature and characteristics of God are visible and open for our immediate experience in the nature and characteristics of the inner divine Consciousness in man, in the works of geniuses, in the words of philosophers, in the deeds of the saints, in the attainments of the scientists, in the beauty of Nature. All that we know of the invisible is from the effects its presence produces. By these effects we know that which is their producer. Since we see the effects here and now, we could say that in that manner, and in that way, we are seeing here and now their producer. Every day we have an experience of God's effects in the world - love, light, value, beauty, wisdom, happiness. Wherever love is experienced, beauty is perceived, truth is known, wisdom is obtained, lasting happiness is found, there we have the immediate touch of God. Love, Beauty, Truth, Wisdom, Happiness, are God, and since they are in us, God is in us now, and insofar as we experience them, we now experience God to that extent. The mirage we see is not the desert, yet without the desert there can be no mirage. From the mirage we know we are in the desert. 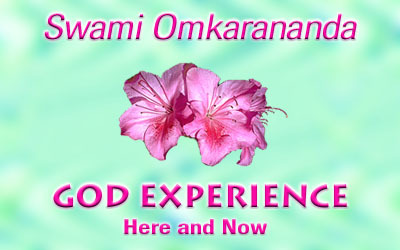 The world of our sense-experience is not God, yet there can be no world without God. From the effect we know we are in the Cause. The world is the effect, God is the Cause. Being in the effect we are in the Cause. God is the infinite divine Consciousness that is within us, and accessible to our immediate experience, at all times, and anywhere. Within ourselves God can be contacted, known, experienced, and His treasures expressed in daily life. Our sense of the Immortal, and consequent conquest of the notion of death, rises from this Consciousness within us. Unlimited freedom, absolute freedom, true freedom belongs to us when, in consciousness, we are one with this Dimension of the Infinite Being in ourselves, in all things, and in all forms of life. There is the Spaceless Dimension in space, and the Timeless Now in every moment of time. In inner contemplative states we can, here and now, rise into this spaceless and timeless Dimension of Consciousness, and experience God. Wherever one may be, to that place God is the Eternal Here, and in whatever period of time we may be, to that period and that moment God is the Eternal Now. God is the Timeless Now and the Spaceless Here. He can be experienced by anyone, anywhere, at any time, and most of all here and now. God is infinite Love, and the way to His experience is through love. Persons who lack charity of feeling, broad views, fundamental goodness impelled by enduring love, will find it difficult to feel His Presence. Knowledge of the reality of God ensues from the development of universal Love. The heart is to be trained and disciplined and its love extended to all creation. A drop of water is, by itself, valueless. But the same drop when expanded to the size of a big ocean, by being dropped into that ocean, acquires imperishable power, beauty, magnificence and value. We obtain the true power, dimensions and value of our personality, the real fulfilment of our life, when we drop the drop of our little heart into the illimitable heart of all creation, and thus make our love universal, cosmic, supracosmic, divine. The noblest phenomenon in Nature is the person whose heart releases universal feelings, and makes all humanity, and all creation, its own, in Love. Founded upon our knowledge of the Presence of God in everything and everyone, we should bear profound reverence for Nature and for humanity. By constantly generating cosmic feelings, we have to acquire a universal personality. The larger the heart, the greater the luminosity of our intelligence, and the keener our sensitivity to the infinite Truth, Beauty, God. Grasp God in love; a love that is wider than the skies that you see with your physical eyes; a love that is denied to nothing that is created; a love that could smile with the flowers, and with the leaves; a love that can become one in sympathy with the stars; a love that could discern and converse with His Presence in the empty space; a love that could find a friend and a beloved in all that is beheld by the physical eyes, the unlimited, unconditioned, unfailing love for all creatures great and small; the love that is in tune with the wondrous existence in the stones, pebbles, and twigs. Such love liberates our consciousness and soul, renders us exceedingly sensitive to God's all-vivifying Presence. When our whole being throbs with this love, we have God-Experience here and now. Be not cheated by appearances. Beneath the veils of Man and Nature, God is most visible. Behind the veil of the day, the stars are most visible. Though it be day, the stars are still there, and as luminous as they appeared at night. Behind the words of the people, there are thoughts. Behind the thoughts, there are minds. Behind the minds, there is the one common universal consciousness. Behind the consciousness, there is God. The stars are always there. The clouds appear and disappear, the day alternates with night, leaving the stars just as luminous and where they were. The words perish. The thoughts disappear. The minds change. But the Consciousness is ever-the-same, luminous, immortal. Know It. Live in its Light. Experience It, and manifest Its creative wonders, delight, peace, perfection, immortality. The reality of God constantly impinges itself upon our intuitions, and His heart yields itself wholly to our love. Hundreds are the ways by which we can know, feel, see, experience God. God reveals Himself in manifold ways and in varying degrees of intensity and luminosity, ranging from an answer given to a calm prayer said in faith, to the divine Self contemplated by the gnostic individual in his own inmost being. God can be caught in our rhapsodies, even as the rhapsodies of St. Augustine caught Him; can be felt as a Presence even as Brother Lawrence felt Him as a Presence; can be recognized as that dynamic reality in Nature, which disturbed the English poet Wordsworth with "thinking a thought sublime". God alone is - this is the voice of the mystics. God is, and the world also is - this is the voice of the theologians. World alone is - this is the voice of the materialists. The experience of the mystic is real, vast, all-illuminating. The experience of the theologian is mental. The experience of the materialist is purely of the senses. Under the pressures of life, the materialist grows into the theologian, and from the theologian is evolved the mystic. Blessed are those who exceed the crudities of the materialist and are released into the dynamic world of the Mystical Experience! As wise as Solomon, as thoughtful as Plato, as pure as St. Theresa, as good and loving as St. Francis, as mature in soul as the Roman Emperor Marcus Aurelius, we are not; yet, what right have we to deny the existence of God they accepted, and reject the revelations of religion they made their experience? Great Minds perceive God; our little minds doubt and deny. Great Faith finds Him; our little faith complains and is repulsed. Great Love experiences Him; our little love is too busy with its own fleeting pleasures. Great Goodness lives in Him; our little goodness is content with itself only to be frustrated and rudely awakened some day. The earlier we seek to know and experience God, by Great Knowledge, Faith, Love, Goodness, the better for us. There is no prayer arising from the heart which God does not hear. He is the all-hearing Ear. No man can fold his hands in prayer without God seeing him. He is the all-seeing Eye. Every prayer that rises from a soul of faith and devotion, is answered. God hears us always, but we have not yet developed the capacity to hear Him. God sees us always, but we have not yet opened our inner eyes to see Him. God has always tenderest feelings for us, and pours on us His infinite Love and Grace, but we have not yet lifted up our hearts in true love for Him. God is all-merciful. Just there He is where we think He is not. Let us learn to pray aright, and see for ourselves the magnificent results that arise from prayers.